I went to see the movie when I was about 14 or 15. I'd listened to some jazz before that as I played violin and some guitar. I know I was an Elvis fan before '58, and a Chuck Berry fan, and a Little Richard fan. I remember "Open the Door, Richard," from when I was probably 6 or so, and partly because although it was a good, catchy song, they played it so much for a while that I really got sick of hearing it. This was probably the year I had my tonsils out, and was sick in bed at home for much of the school year, lying in bed, watching these masons building a big brick church next door to our house in Raleigh, watching them toss brick up from the ground to the men on the scaffold, which from my vantage looked like cardinals fluttering up and coming to a stop in midair, till I got up and looked more carefully out the window. So much later, then, I went to see the movie. "Jazz on a Summer Day" is like a collection of absolutely perfect music videos, studies of the playing, the players, the audience (in some cases--one wonderful scene involves only a cello player at practice in a room, the notes, sweat, cigarette smoke). Miss O'Day is ravishing, and the camera loves her with the love of a young teenage boy, it caresses her bit by bit, and it enfolds the performance and captures the freedom of jazz, the fact that jazz is an event, that it must be live, that it really is of the moment, as Miss O'Day's musical artistry is always of the moment. I'm sure I fell in love with her, like probably everyone who ever saw this perfect moment. Even Miss O'Day, herself, said much much later that it was the greatest moment in her life. But she lived to find these moments again and again, and captured many of them, and a few were captured on film and record, and so we still can go and hear these bits of her living life, of doing what she absolutely loved to do, and did, at a level almost no one else could even imagine. I forgot about the movie, more or less. I don't have a copy, even after it became something one could buy as the digital age arrived like a soft drizzle into all our lives in the '80s. I forgot about Miss Anita. My musical interests went in other directions, as over the years I found that I loved performing, loved finding the moment myself, not at the sublime level she could attain certainly, but that's one thing about performing--you don't have to be quite that good to do a good job, and particularly if you are sensible in what you choose to try. For some folks, that is to say, running up a flight of steps might be the thing to try on a good day, rather than, say, doing a 360 off the un-parallel bars, mat or no mat. Mike Craver says Miss O'Day played in Chapel Hill at a jazz club they used to have there called Stephen's Afer Hours, back in the '80s. He went to see her. Said she was feisty, and had a little dog for a travelling companion, the dog named Emily. I don't know how he knows all those details. He told them to me when I sent him an email about seeing her again, after all these years, in a documentary of her life called "The Life of a Jazz Singer." 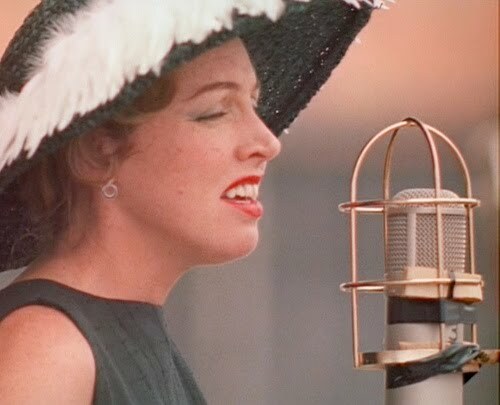 They play a bit of the Newport movie in the documentary, and lots of interviews of her, at many different moments in her life, and quite a lot of her music, which is sublime in every case. There's a lot to read and listen to, if you want to know about Anita O'Day. But when I saw that clip from the Newport movie I remembered in some weird sense of that term that I actually fell in love with her, in that young teenage way, with how beautiful she is, because she is so completely "in" the song she's doing and presenting such a perfect moment of herself to the audience, not even "selling" to the camera, just totally singing, at that immersed in the music way she could accomplish. Which is oddly just like what laying bricks is like, at its best--when you're simply thinking in bricks, one after the other, just like notes, in the "flow" to use one of the cliches about it. As Dylan said: "The bricks lay on Grande Street,... they seem so well-timed...."
The documentary, which ran on the documentary channel the other day, ends with Miss O'Day at 86, fiercely alive if certainly very aged, and with a fiercely true philosophy of life, a way of understanding how to live and how to accept and how to go on, as long as you can. She'd even made a record not long before, called "The Indestructible Anita O'Day" I think, her voice ravaged to some extent from a botched hospital procedure that started out as an emergency room repair of a broken arm and ended up nearly killing her. I was glad to think, at the end, as they rolled the credits, that she was still kicking, and saddened to find that she'd died not long after those last interviews, in her sleep, a heart attack with pneumonia as a proximate cause, in 2006. There's a lot of her talk on youtube. Her account of Judy Garland's death is rather striking, as she was almost witness to it. She's much harder--someone in the documentary calls her "hardboiled"--than that beautiful portrait I fell in love with. But of course falling in love with a portrait is exactly what a young teenage would do, and something Miss O'Day would probably laugh at, in a fairly gentle way, at least as long as the supplicant didn't get in her face. There's not much of the edge that must have been there in the documentary, and much more of her ability to deal with what is, to go on, which is what a survivor has ultimately to master. Her understanding offends a very youthful Byrant Gumble at one point. He challenges her statement in her autobiography, "Hard Times, High Times," that everyone is a loser. He even challenges her report of the moment when she tried heroin, that she tried it "because it was there." To which she reponds, "I'm just playing it as it lays, Bryant!" Too many people have decided that the drug thing, which is just part of the world of music, is the big thing in Miss O'Day's life, and somehow explains the fabulous artistry. "She was high when she performed at Newport," people say, implying that this is a hidden flaw in that perfect moment. Plus, it was heroin she was high on. Oh the humanity, oh the horror. How sad that we have to leap to such judgments, that we so often think and fail to trust our "lying eyes." And how completely distrustful of the lesson Miss O'Day freely imparted to all of us, to trust the moment, to live as hard and deeply as you can, to believe in every note. I only found out yesterday that Anita O'Day has died. If you want to learn to play the fiddle, buy some of her records. That's the best thing I can say about her. what a gorgeous and thoughtful tribute, from the flying cardinal-like bricks, to emily the dog, to your remembrances as a teenager. i am trying to think if anyone affected me like that when i was that young, and the only person i can think of was E.B. white or maybe James Thurber, but it was quite different, more cerebral, it was only their words, not voice or face. i'd never heard of Anita O'Day before reading this, but now I am quite sure i will never forget her.